Three California Sea Lions Go "Home for the Holidays"
Second Street, a subadult California sea lion, was named for a nearby cafe where the volunteer involved in the rescue works. Second Street was definitely in need of help. He was severely swollen along his left hind flipper and most likely was in pain. It turns out that Second Street had a fractured left tibia and an abscess at the ‘ankle’ on that side. In California sea lions, the tibia lays next to the fibula and a sea lion’s fibula is fairly solid- so this fracture didn’t need a cast or pins. Second Street, a California sea lion from Monterey, was released on December 9, 2010. Veterinarians and volunteers immediately began treating the wound to prevent the spread of infection and give the wound some time to heal. 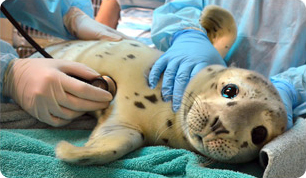 Additionally, veterinarians worked to get his body weight up by feeding him herring daily. Soon, he began to show signs of improvement, even gaining back some of the weight he'd lost due to the flipper wound. Just before he was due to be released, Center veterinarians implanted a loop recorder in Second Street to monitor the heart functions of a normal California sea lion. Now, almost exactly a month later, Second Street was able to return back to his ocean home on December 9 with both of his flippers working properly. Miraculously, he’ll be in better shape to navigate the waters, compete for food and escape predators. Even better, Second Street is getting home just in time for the holidays! Happily, Second Street did not return home to the ocean alone. Two other California sea lion patients from the Center accompanied him back to the wild on December 9: Taylors Day and Dobby. Taylors Day was named for a little girl (Taylor) who was having a birthday party on the beach that day. A juvenile male California sea lion, Taylors Day was treated for leptospirosis. Leptospirosis is a bacterial infection of the kidneys. In fact, the disease can cause permanent kidney damage if left untreated. California sea lions with leptospirosis can even die from the disease. Fortunately for Taylors Day, the Center treated him for leptospirosis and he was able to return to the ocean with Second Street and Dobby. The Center's veterinarians also implanted a loop recorder in Taylors Day to monitor his heart function. Dobby, another subadult male California sea lion, was spotted at Fitzgerald Marine Reserve in San Mateo County on November 15. He was extremely lethargic and non-responsive when volunteers from the Center arrived. Once at the hospital, Dobby was treated for malnutrition and had a chance to rest and recuperate. In less than a month, he regained enough weight to join Second Street and Taylors Day in their return to the ocean at Rodeo Beach in the Marin Headlands in Sausalito, California.